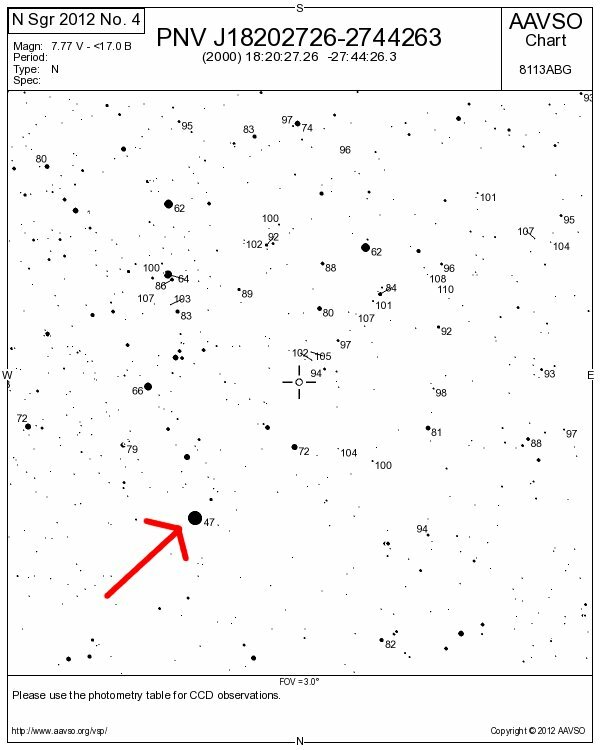 A fairly bright nova has been discovered in Japan by Koichi Nishiyama (from Kurame) and Fujio Kabashima (Miyaki). They made their find on July 7, 2012, using a 105-mm f/4 camera lens and CCD, describing the nova as magnitude 7.8. It is located in Sagittarius roughly between the “lid” and “spout” of the Teapot stars, at right ascension 18h 20.5m, declination -27° 44′ (equinox 2000.0). A number of other observers in Japan have made confirming sightings. The discovery was announced on CBET 3166, issued July 7th by the Central Bureau for Astronomical Telegrams in Cambridge, Massachusetts. This circular assigns the star the official designations Nova Sagittarii 2012 No. 4 and also PNV J18202726-2744263. The American Association of Variable Star Observers (AAVSO) is requesting observations of this nova. The AAVSO collects magnitude determinations by skilled observers to aid in the study of novae and other variable stars, and their site offers guidance on the techniques involved. Whether or not you go as far as submitting observations to the AAVSO, the nova should be fun to track down and a relatively easy catch. And, hey, since you’ll be in Sagittarius anyway, you’ll have plenty of other pretty things to look at after you find the nova. Here’s a widefield finder chart I knocked up in GIMP, using this photo from Wikipedia. 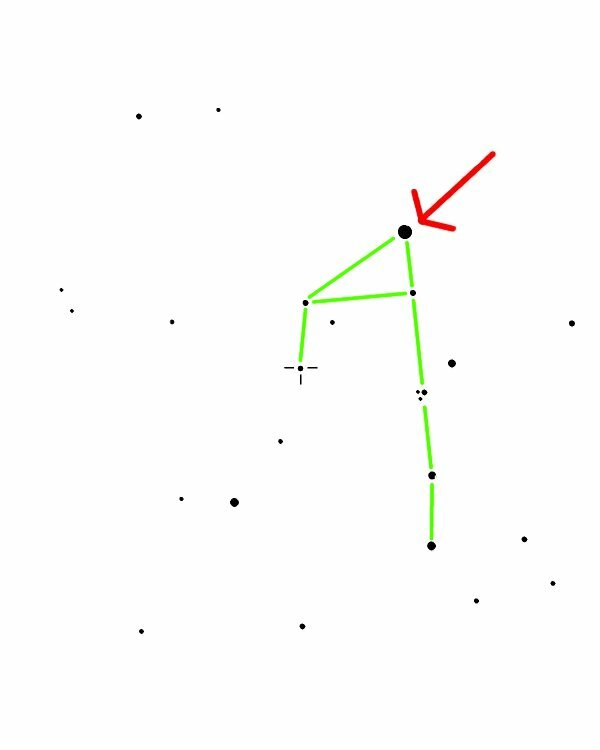 The green lines mark out the “teapot” asterism in Sagittarius–if you don’t know how to find this, check here. The box is the field shown in the closeup finder chart below. The nova is indicated by the white cross. The red arrow is not the nova, it’s a magnitude 4.7 field star that will help you orient the closeup finder chart. And here’s the closeup finder chart, courtesy of the AAVSO’s free oonline chart generator. I added the arrow to indicate the same field star as shown in the above image (the arrow points the same way, too). This is rotated 180 degrees from the sky (for Northern Hemisphere observers looking south) and from the widefield finder chart above, so you can use it as-is in a Newtonian reflector or straight-through finderscope, or flip it around for binoculars or a right-angle correct-image (RACI) finder. If you have a refractor or Cassegrain scope and you’re using a star diagonal, you can use the AAVSO plotter to make a rightside-up but reversed chart to match what you’ll see at the eyepiece. Copy and paste the nova’s designation into the box and select the options you want: PNV J18202726-2744263. And now I’m going to post this and go look for the nova myself. Happy hunting! Update the next day (July 8): I found it. I had to do a lot of flipping back and forth between chart and telescope to make sure I had the right object–it looks just like another 7th magnitude star in the eyepiece. And actually I used the finder rather than the scope. A 10×50 finder (or just about any pair of binoculars) collects enough light to show the nova easily, and gives a wide enough field to make it easy to find. I was using the SkyWatcher 90mm Mak, which has a maximum true field of about 1.5 degrees–too narrow to show most of the surrounding stars I needed to use to orient myself (imagine plotting a cross-country trip on Google Maps if you couldn’t zoom out and only saw a 10-mile stretch at a time). Anyway, in all of the back-and-forthing I figured out a couple of geometric relationships that helped me figure out which 7th magnitude star was the nova. The next two charts are modifications of the AAVSO chart that show these relationships. I stripped out all the stars fainter than 8th magnitude, and all of the clutter of magnitude numbers, and rotated the charts 180 degrees to match the view in binoculars or a RACI finder (from the Northern Hemisphere). 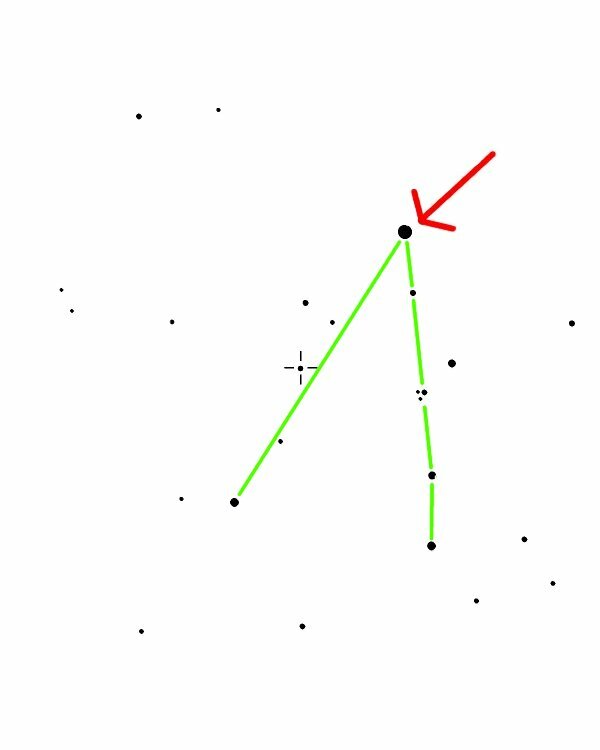 First, the 4th magnitude star (red arrow) that I use as my “anchor” in this stretch of Sagittarius sits at the top of a north-south chain of 6th and 7th magnitude stars, and makes a diagonal with the second-brightest star in the field. The nova is about midway along that diagonal line, just above and to the left. That helped, but as usual I was nervous about whether the star I thought was the nova actually was, so I used another relationship to double check. The “anchor” star forms a right triangle with the two closest semi-bright (~6th-7th magnitude) stars, and the nova is almost straight down from the left-hand (eastern) point of the triangle. Looking at chart: Okay, there should be an arc of four stars like an eyebrow about two degrees left of [bright star]. Looking through finder: Got it. Back to chart: Hmm, if I follow that arc to right, I should find a triangle of faint stars that points to [target]. Looking through finder: Sweeping right…hmm. 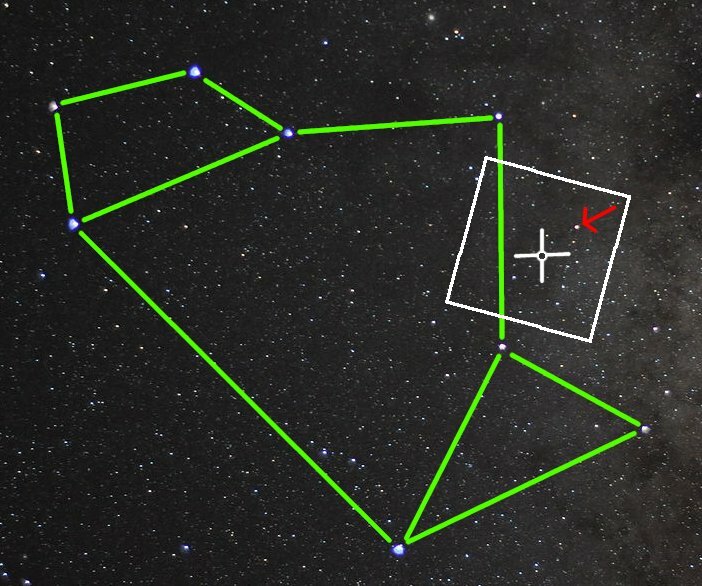 There’s a triangle of faint stars, but is it the right one? I should find [target] right over here, but…nothing there. Back to chart: Okay, now I see that the triangle of faint stars I want is not just right of the “eyebrow”, but right and a bit down, and it has a pair of stars like eyes just to the south. Looking through eyepiece: Well, hello beautiful!